This outdoor bean bag game started off as improvised entertainment at the beach. Anthony Esposito and his sons invented a sea-shell toss competition that evolved into an all-time crowd pleaser. It folds down to a compact, portable size that fits inside an included carrying case so you can play while you’re tailgating, camping, in your backyard or—like Anthony’s family—at the beach. And if that's still not small enough, try the miniature version: Blitz Bean Bag and Pong Toss. The game is straightforward. 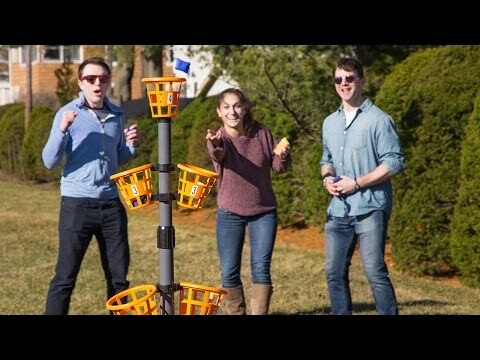 It’s got a single tower with adjustable baskets—each one has a different point value—that you set up and then toss at. Whether you play individually or in teams, the goal is to make it to 21 points. 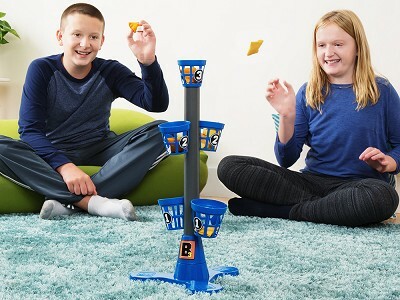 Easy to pack and easy to play, Bean Bag Bucketz entertains the whole family. Hello everyone! I'm proud to introduce Bean Bag Bucketz to The Grommet. I'd be happy to answer any questions you have! Nice! I gotta ask: at which Jersey shore beach was the concept created? 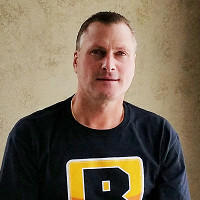 Yes, I am a Jersey guy! @Nicholas...Nicholas...thank you for the first question! Anthony came up with the original concept around Manasquan Beach! Hi! How does this stay up at the beach and in the wind? Does it anchor in the sand? Thanks! @Megan we took a lot of time to make sure B3 was built for great game play, while having the durability to enjoy in aany conditions. Anthony and I had B3 out playing on Jersey Shore with 30 MPH winds...stood up all day. The size of the base keeps game from tipping over. Thanks for the question. Looks really cool! Definitely need one for this summer bbqs and tailgating at the Giants games! What stores can I find it in? @Mary Lynn B3 is perfect for tailgating and any summer party. Its set up is for a lot of social activity, competitive play and fun. The great news is B3 is launching today here on Grommet and is available for purchase today! Neat idea. Two questions - 1) do the buckets come in any different colors? 2) can any type of bean bag work if different colors were purchased in a store? @Anthony ...thanks for the kudos!!! Our game colors for the Bucketz are available in this Awesome Orange! Also, the bags are specifically designed for B3, and the good news is Bean Bag Bucketz comes with 16 bean bags! Seems a bit overpriced - more like $30 for 5 little buckets and a pole? 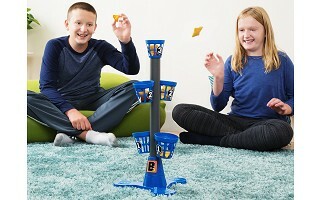 @Joann Bean Bag Bucketz comes with 7 Bucketz, 16 bean bags, high quality telescopic tower and a high quality carry bag. We focus our energy on making sure this game was built to be very durable of high quality materials. The carry bag will make it easy to take with you anywhere from the beach, to tailgating, special events or any occasion that is ready for fun social activity. Thank you. @Paula Great question! While B3 is made of very durable materials...we wanted to make sure that this game is portable. The weight in the carry bag is less than 7 lbs. Why not make it GLOW I THE DARK at this price level - so you could play in the dark as well? @Joann great suggestion...always enjoy hearing about how others see this game coming to life for their enjoyment! @Valesco thanks Valesco! The Grommet has them ready to ship out...you can get one today..here on their site. @Jana B3 is supported by a high quality tri-pod stand...there is no holes to be dug to set up and enjoy B3. One of the great qualities of B3 is you can easily move and play anywhere! Thanks for the question. This outdoor bean bag game started off as improvised entertainment at the beach. Anthony Esposito and his sons invented a sea-shell toss competition that evolved into an all-time crowd pleaser. It folds down to a compact, portable size that fits inside an included carrying case so you can play while you’re tailgating, camping, in your backyard or—like Anthony’s family—at the beach. And if that's still not small enough, try the miniature version: Blitz Bean Bag and Pong Toss. The game is straightforward. 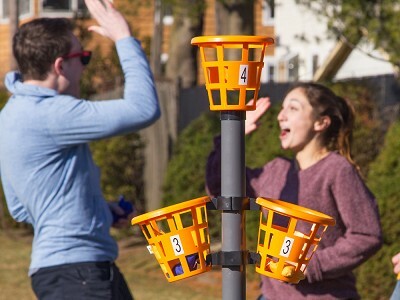 It’s got a single tower with adjustable baskets—each one has a different point value—that you set up and then toss at. Whether you play individually or in teams, the goal is to make it to 21 points.